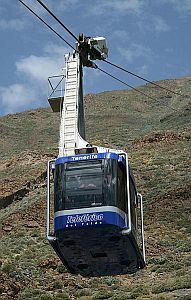 For the visit to the Pico del Teide, you need to get yourself to the cable car station, Teleférico del Teide. The journey there is an adventure in itself and can be made by car, tour bus, public bus, or, if you're really fit, on foot. The Tenerife island tours that are available will take you through the National Park and give you sightseeing opportunities around Teide and its neighbouring mountains and some will take you to the cable car station, parking up to let you ascend in the cable car. If you elect to go by bus, then TITSA operates some services that do the journey. 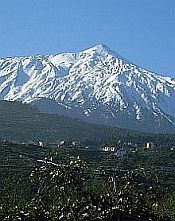 By car, you take the TF-21 road from La Orotava to the north and Vilaflor to the south. From La Laguna, take the TF-24 and from Los Gigantes, the TF-23. Whether you are in a bus, coach or car, you'll find yourself initially being driven along windy mountain roads, going ever higher. Ears will pop! The road takes you through the pine forests and large pine cones are everywhere! 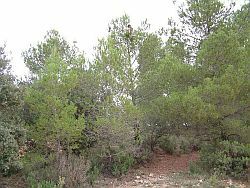 There are pine cones on the trees, pine cones lining the road and pine cones littering the road. Depending on the time of year, you might eventually find yourself driving through what appears to be mist. No! You're driving through the clouds! Subsequently, in much the same way as an aircraft does during its initial climb, you'll emerge from the clouds into bright sunshine. You'll start to notice small pockets of snow here and there and, should you get out of your vehicle, you'll find it's pretty cold. Your first stop on the way to the Pico del Teide might be the Parador de Cañadas del Teide, found on the TF-21 road. This is essentially a hotel positioned right next to Teide and is an oasis of luxury nestled amongst the mountains. You can imagine the view from its windows! I can't tell from its website if its amenities, such as the bar and restaurant, are open to non-residents, but if you want to check it out yourself, click here. A few miles further along the TF-21, you'll come to the cable car station, known as La Rambleta. There's ample parking and you'll also find a sourvenir shop, a bar and a restaurant. Here, you can buy tickets for the journey up the final bit of the mountain. (It's not taking you to the actual summit, but more of that later.) The cable car can only accommodate a maximum of 35 people and, as this is a very popular attraction, there can be very long queues. Should the weather be a bit unsuitable, with strong winds, say, then the cable car will not run. Its first departure for the day is at 9am. The last upward trip is at 4pm, with the final downward one is 5pm. 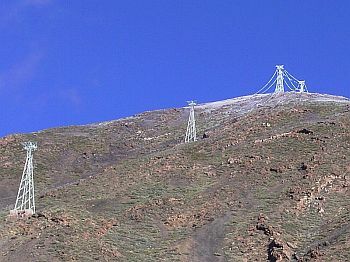 The La Rambleta departure point is already at an altitude of about 7,730 feet. If you've queued and obtained your ticket, the eight-minute cable car ride will take you up a further 670 feet, where you'll find viewing platforms. You're not at the summit yet! There is an access trail to it, called Telesforo Bravo, which is yet another 650 feet, but it's not a free-for-all for everyone to scramble up. 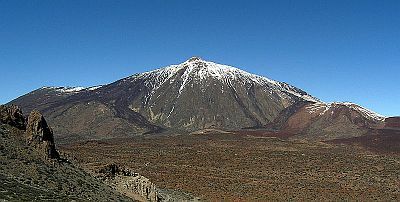 Over the years, the area's natural ecosystem has become in danger from the presence of so many tourists and the National Park Administration authority decided to restrict access to the actual Pico del Teide to people who have obtained a special permit at least eight days in advance. It is open from 9am to 4pm, Monday to Friday and you need to take a photocopy of your passport with you. The other option is probably far easier, as you can apply online. First of all, click on this link. On the resultant page, first select your preferred date. Only the green ones are available. Once this is done, to the right it will show which two-hour time slots are available on that date. Choose the one you prefer and click on SELECCIONAR. Finally, type the number of people in your party in the box underneath. Click on PASO SEGUIENTE, at the bottom of the page. On the next page, you're required to give details of yourself and the rest of your party. In the drop-down list of TIPO DE DOCUMENTARIO, select pasaporte. In the box No de DOCUMENTO, put your passport number. NOMBRE is your first name, APELLIDOS is your surname. For NACIONALIDAD (if you're British), choose Reino Unido. Under DATOS del GRUPO, insert first and last names of other members of your party and their passport numbers. The other boxes may be left blank. Finally, at the bottom of the page, tick the box on the right, then click on PASO SEGUIENTE. When you take the trail, you must keep precisely to the marked out path and there are rangers lining the route to make sure you do. They come armed with whistles and will toot them angrily if anyone deviates from the path. 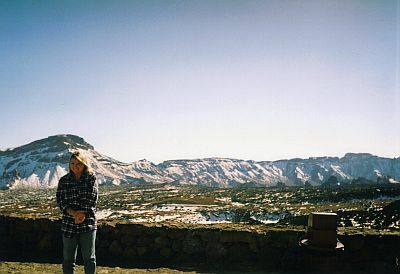 As for the crater of Teide, there is no access allowed whatsover, under any circumstances. Halfway up Teide, there is a spot where climbers can make an overnight stop-off. Called the Altavista Refuge, it has basic amenities, such as a kitchen, an infirmary and three dormitories, accommodating up to 60 people. Stays are restricted to one night only. The price is 20 euros (over 65 years, 10 euros). 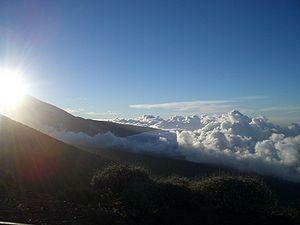 Please be aware of the altitude of Pico del Teide. The air is thin and the final walk to the summit should not be attempted by people with breathing or heart problems. Whatever the season, it's going to be cold up there, so take some appropriate clothing.